My visit to San Francisco this July after a whole year, it not just a trip to the city, but to actually live in it for a few weeks. I cannot help but draw comparisons between this place and the one I call home; I tell you, there is no comparison, but then there can’t be! How can I just sit here and compare that every person on a 2 wheeler wears a helmet, even the pillion rider, and they actually wear their helmets, not balanced them on their petrol tanks like where I live. People only cross the road when the lights permit them to, not wander off helter skelter, and challenge the motorist to the right of way! I see another glaring difference, there are garbage drums along the pavements at intervals and people actually use them; they don’t throw stuff out of their moving cars, there is no litter on the roads, and, even when they take their dogs for walks they clean up after them!! I did too when I had to take our little Havanese dog ‘Hero” out to respond to the call of nature! The parks, and there are many! just like where I live, are beautiful and green no litter no mess just people sitting or strolling, kids playing, dogs running about chasing each other or their masters or playing fetch! Actually ignoring others or expressing curiosity at their fellow species, but not fighting!!! Unbelievable! Even the dogs are well behaved and mannered! People are polite, they queue up to enter a bus, they queue up to buy their tickets they even queue up to queue up! Traffic lights are not jumped, and there is always a patrol car about when you least expect it, to nab you if you choose to break the law! Now that’s not saying the people here don’t break the law! Yes they do and by the dozens, for every type of crime there is a designated punishment, (you did the crime , you pay the fine or you do the time! )but overall they are law abiding, God fearing, and they have what we don’t back home, the caring for the community to which they belong! i.e. the Neighborhood! The architecture is so varied, their buildings all have car parks for the residents and tenants and there are parking meters on the pavements for visitors; so there is never an issue about whose parking space it is or that you cant park here because some muscle-bound sumo wrestler chooses to stop you because he can! Talking of which, all of what I have shared with you, is governed by the laws of the city, state and country, and no one and I mean no one is above the law, not even the police chief or the President of the country; people do not cheat, lie or steal, in general but there are exceptions and that is the rule! If you are caught out you have to take the consequences. In a restaurant, or in a café, people bring their kids, who know that they should not disturb other around them, if the child does misbehave, the parents will leave the café, rather than permit the child to play up and throw a tantrum! I saw this unfold right before my eyes, in fact I saw all that I have mentioned take place; the mother took the child outside and sat down with him on a pavement seating and proceeded to explain but when the child would not stop his tantrum, he was promptly walked home, without any treat! That’s the way it is, here. I have watched and waited, for an opportunity to record the breaking of the rules or laws, and I continue to wait and watch! This city has one of the most impressive transport systems I have ever experienced! For $15 one can travel all over SFO on any mode of transit, like buses, cable cars or BART for a full month! So during the day we mostly get around like that; the buses are are very well run, there are seats for the elderly (senior citizens) infirmed/disabled and even wheel chairs! I watched as I was asked to vacate a seat which was turned up and floor space was cleared for the motorized chair to come up the ramp which was extended from the bus while the bus actually lowered its suspension on that side where the door is located; so the chair comes up from the pavement into the bus and is parked where the place is assigned for it! All the while the driver kept an eye on the progress and when all was secure the doors closed and away we went ! The seating is so spacious and everyone is sitting without hassle. The Bus stops have a read-out that tells you when which bus will arrive and bang on time it is there! Their systems actually work why don’t they work in my city? I have been reading several arguments from our dear Indian friends about how crappy Lollywood has become, so I decided to look at this situation from a...different perspective. What has the great city of Lahore contributed to the nation of India? Ok first of all, India is not in an economical position to make multi-billion rupee films that it presently produces, and we all know for a fact that the films produced now are because of the BIG money being filtered in by the underworld. So if "Bollywood" made films according to THEIR budget, the films wouldn't necessarily be worth watching right? oooops...like they are now? hmmm? Its all there, the big names, the big costumes, the big tears, the big (cheesy) dialogues...the "dishown dishwon fight scenes" but whats missing..?? Before we start hating on "Lollywood" or Lahore, lets remember Bollywood has not been able to bring quality cinema in ages ..with a few exceptions....talent is essentially non-existent, the "hit" and 'super-hit" films are nothing but 'time-pass' or trunk shows for big designers like Ritu Kumar, Manish Malhotra etc... very strategically targeting desi shopaholic housewives. (apologies for the stereotype). One might argue that Lahore played no role in the creation of "Bollywood", lets put that myth aside..shall we....and take a minute to trace the birth of "talent" through the great city of Lahore. First and foremost, India's Taran-e-Hindi "Saray Jahan Say Acha, Hindustan Hamara" Written by Dr.Allama Iqbal from Lahore. Yes not many Indians know much about the author hence their disability to give recognition to originality. I should stop here and rest my case, but I feel compelled to continue. Teji Kaur Bachchan, the mother of Amitabh Bachchan ,was a prominent lecturer in Lahore University. The first silent film from Lahore was The Daughter of Today, released in 1924 directed by A. K. Kardar a Lahori, who went on to become one of the most famous film directors of India during the 1930's, 40's and 50's. First talkie produced from Lahore was Heer Ranjha in 1932. The actress who played the lead in Anarkali, Shahjahan, Shireen Farhan and Daasi was Ragni, also from Lahore. Om Prakash was given his break by Dalsukh Pancholi (Founder of Pancholi Studios in Lahore) in the Film Daasi. Lahore gave us legends like Muhammad Rafi, Om Parkash, Dev Ananad saab, Pran saab and Balraj Sahani (one of the most talented actors in "bollywood") and many many more, who started their career in Lahore. 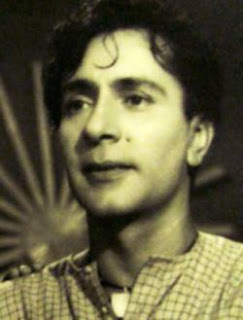 Chaitan Anand (Dev's brother) was a famous film director in Lahore. 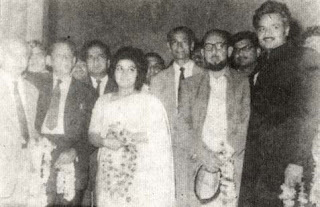 Mohd Rafi was introduced to radio Lahore by music composer Feroz Nizami (Lahori) and made his debut as a playback singer in the Punjabi film Gul Baloch. Dalsukh Pancholi, a film tycoon from Lahore (born in Karachi) and the founder of Pancholi Studios of Lahore, studied scriptwriting and cinematography from New York, and played an important part in the careers of stars such as Noor Jehan, Ramola, Om Prakash, music composers Ghulam Haider and O.P. Nayyar. His first film was Gul-e-Bakawli (1938) starring Noor Jehan. Ghulam Haider's "shaala jawaania" one of my personal favorites of Madam, was an instant rage. 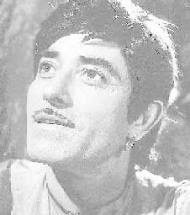 His film Khazanchi was one of the longest running movies of its time. Pran established his career in Lahore as a villan in punjabi films. Mohd Rafi's debut also happened to occur in Lahore, at the hands of music director Shayaam Sunder and Pancholi in the film Gul Baloch. 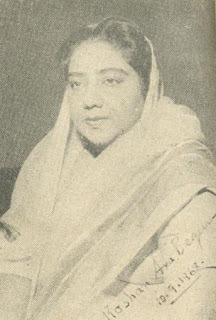 Roshan Ara Begum from Lahore was acclaimed the best interpreter of Kirana Gharana Sytle of Khayal singing in the subcontinent. Composer O.P Nayyar, Ustad Fateh Ali, BarRay Ghulam Ali (the only film he ever sang for was for Mughal-e-Azam) free of charge... only as a favor to Naushad, all are from Lahore. Father of the Chopras, B. R. Chopra was born in Lahore. He studied journalism, directed/produced plays, and worked as a film critic in Lahore. Yash Chopra, B. R’s younger brother was born in Lahore as well, later he joined his brother in Bombay to start their own production house. B.R. Chopra was working on his first film Chandni Chowk when the partition riots began. Academy Award winner lyricist Gulzar was born in Jehlum, Punjab. Grandpa Roshan (Roshan Lal) from Gujranwala, Lahore, was given a chance as an assistant by another Lahori musician, Khwaja Khurshid Anwar (who was in Bombay at the time). Rudyard Kipling was also a Lahori. Actress Meena Shorey (Khurshid) the "Lara Lapa" girl one of the earliest bombshells of Bollywood was from Lahore (Raiwind). 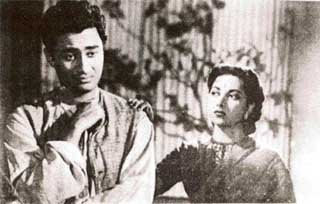 Her husband was Roop K. Shorey, a Quetta-born actor/director, and the owner of Kamla Movietone in Lahore. He later moved to India after the partition. His film Mangti ran over 75 weeks in Lahore in the forties, making it his most profitable film. Suraiya (singer and actress) hails from Sialkot. K. L. Saigal (singer) acquired fame in Lahore then later moved to Calcutta. 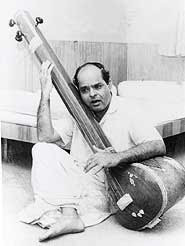 His last film was in 1947, music composed by Khwaja Khurshid Anwar from Lahore. Famous Musicians from Lahore who migrated later. Pundit Amarnath, Shayum Sunder, Gobind Ram, Lachi Ram, Dhanni Ram were more than compensated by the arrival of Ustad Sardar Khan, Ustad Akhter Hussain Khan, Bundoo Khan, Nazakat Ali, Salamat Ali, Amanat Ali Fateh Ali, Bhai Lal and Ghulam Hassan Shaggan. There were musicians who were already in Lahore like Bade Ghulam Ali Khan, Inayat Bai Dheerowali, Shamshad Begum, Sohni, Alamgir Khan, Sadiq Ai Mando. Khayyam the music composer of Umrao-Jaan fame started his career in Lahore. Many pre-partition films were produced in Lahore. Lahore was considered the 'launchpad' for new actors, directors and producers. Pre-partition, Lahore happened to be the Head Quarters of India's Northern Circuit in the mid-forties. 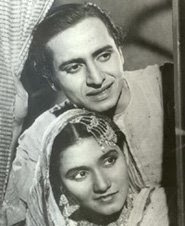 Noorjehan and her director-editor husband Shaukat Rizvi, actor-director Nazir and her actress wife Swaran Lata, director Subtain Rizvi, composers Master Ghulam Haider, Khwaja Khursheed Anwar, and producer-director W.Z.Ahmad all moved during partition. Sahir Ludhianvi (Abdul Hayee) started his career in Lahore as a lyricist/poet, who later went on to become one of he biggest lyricist in Bollywood. Raj Kumar of Mother India fame was born in Baluchistan, and who can forget the tragedy king Dilip Kumar (Yousuf Khan) from Peshawar, its not Lahore but yes its this side of the border. "Woh geet jo aaj tak aap ne nahin sunay, Woh naghme jo Noor Jehan ne aaj tak nahin gaey". 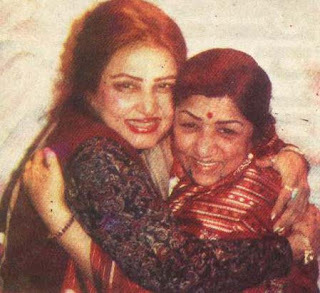 The love for music in the subcontinent lead Noor Jehan to jump start the careers of many music directors and filmmakers as she took over through her singing and acting talents. After listening to her voice one can forget the boundaries drawn by man. She was and is a wonder that shall remain with us forever. Recently Lahore has given India Noor Jehan, Nusrat Fateh Ali, Sabri Brothers, Adnan Sami Khan, Reshma, Mehdi Hassan, Abida Parveen, Tassawar Khanum, Atif Aslam Ghulam Ali, Rahat Fateh, Shafqat Amanat Ali---- for their talent truly saturates Bollywood. Numerous Bollywood films and Indian music directors have taken credit for their work. Yet they say Lahore has given them nothing? hmm? These are just a few examples of how Lahore has contributed to the success of "Bollywood"
I find it sad how a line drawn on the map can make people so ungrateful and hostile when it comes to giving credit to such great artists and the great city that produced them.